Nothing is better on a cold night than a hearty bowl of soup and this is one for the coldest of nights. 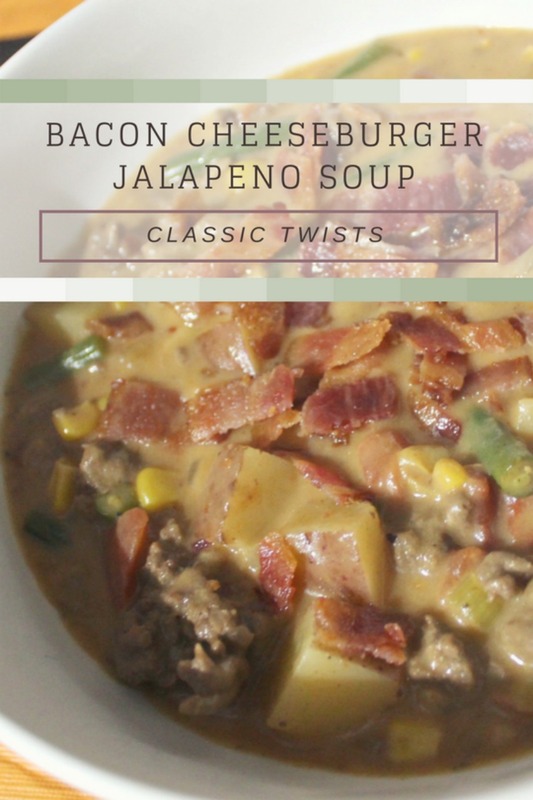 Inspired by a calorie loaded Bacon Cheeseburger, this soup takes the best parts of the classic comfort food and puts them into a soup. Made with fresh ingredients, it’s not the worst thing for you nutrition-wise but that whole milk and cheese adds a creamy richness taking it to the next level. Believe me, this will become a favorite in your home just as much as mine. Let’s start with the basics. Ground beef, onion and garlic act as the hamburger patty. The jalapeno adds a nice touch of spice and pepper for a more robust flavor profile. The potatoes represent the fries that would accompany the burger and the starch penetrates the broth so that it gets extra thick and creamy. The diced tomatoes act as the tomato slice on top, the celery is a substitute for the lettuce to balance the heartiness with a bit of freshness. Corn and green beans bring a little extra veggie action, both of which you might see next to a burger. Finally, the cheese at the end is subtle and not overpowering but still very much a vital part of this concoction. You can’t have a burger without cheese so this soup will also not be without the cheese! The remaining ingredients are necessary to make the soup complete. Flour and butter come together for a roux to act as a thickener for the chicken stock and milk or heavy cream, either of which work fine in this recipe. If you prefer a thicker soup, heavy cream is ideal but whole milk gives it the creaminess necessary as well. Red pepper flakes add an extra touch of heat towards the end and finally on top go the crunchy bacon bits. The soup wouldn’t be complete without crunchy bacon! They add texture, saltiness and that wonderful bacon flavor. 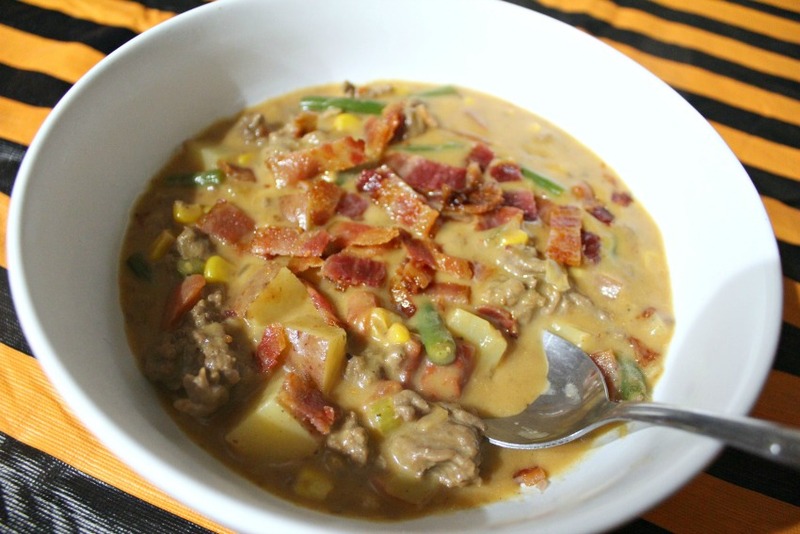 I would go so far as to say that I’d make this soup over a real Bacon Cheeseburger any day. Why? Because the calorie count is way lower for starters. Also, it doesn’t sit in your stomach like a brick that you know you’ll be regretting in a few hours. Finally, the ingredients are all in one bowl and at their best. The bacon part of Bacon Cheeseburgers is usually soggy or limp. The bacon that garnishes this soup is crunchy and firm, as it should be. How do you take your Bacon Cheeseburgers? Built-up our souped up? 1 - In a large pot, brown the meat over medium-high heat. Once cooked through, remove to a plate lined with paper towels to drain the excess grease. 2 - Add the onion, garlic, jalapeno and celery to the pot. Cook 3-5 minutes until softened. Add the butter and once melted whisk in the flour cooking until golden, about 2-3 minutes. Slowly add in one cup of the stock, whisking to get rid of any clumps. Add the remaining stock followed by the potatoes, tomatoes, corn and green beans. Bring the soup to a boil and simmer 15-20 minutes until the veggies are soft, especially the potatoes. 3 - Add in the milk or heavy cream, red pepper flakes, cheese and cooked beef. Stir to mix all of the ingredients together and let simmer for another 10 minutes. Serve with the bacon bits sprinkled on top.